Sharita Gruberg is the director of policy for the LGBT Research and Communications Project at American Progress. She comes to American Progress with extensive experience working in immigration advocacy, law, and policy, as well as experience providing direct service to immigration detainees, refugees, and asylum seekers. 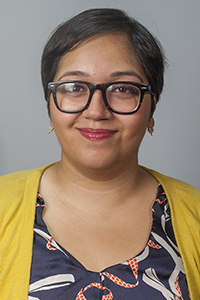 Prior to joining American Progress, Sharita worked as a program specialist for the Women’s Refugee Commission. In that capacity she lobbied Congress and administrative agencies for increased protections for migrant populations, particularly women, families, and unaccompanied children. She has also worked as a law clerk for the American Bar Association Commission on Immigration, where she provided support to immigration detainees in removal proceedings, including LGBT asylum seekers, and filed complaints on detention conditions with the Department of Homeland Security. Most recently, she completed a fellowship with the U.N. High Commissioner for Refugees, where she wrote and submitted refugee resettlement requests to safe third countries and liaised with congressional offices on refugee resettlement cases. Sharita earned her J.D. from the Georgetown University Law Center, where she was a public interest law scholar and the writing program director for the Georgetown Journal on Poverty Law and Policy, and she also received the Refugees and Humanitarian Emergencies Certificate from the Institute for the Study of International Migration. She holds a B.A. in political science and women’s studies from the University of North Carolina at Chapel Hill.